Hoping to fill its coffers before winter sets in, the circus steers its wagons to The Clearing, a remote community deep in the Oregon wilderness, surrounded by an ominous dark wood. Word is that a travelling show can turn a tidy profit at The Clearing, but there are whispers, too, of unexplained disappearances that afflict one out of every four shows that pass through the town. 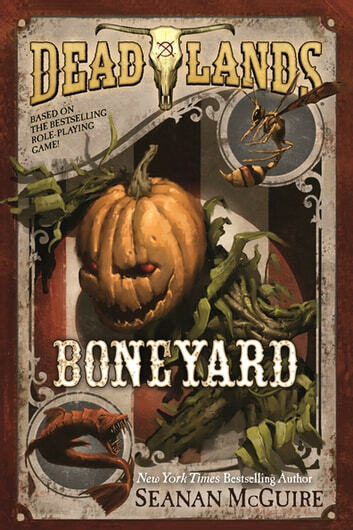 From the twisted mind of Seanan McGuire comes a gripping tale of the Weird West, set on the haunted frontier of DEADLANDS, the award-winning game from Pinnacle Entertainment Group. *I was given this free review copy audiobook at my request and have voluntarily left this review. Emily is a new voice actor for me. I found I liked her early on. She tells us the story as though I'm sitting and listening to a talented story teller. When she comes to the voices of the characters she puts added tones and innuendos into the voices that fit for the characters. Each character had their own voice and emotion to fit their personality and the moment they are in. She even voices a little girl as young as she should sound. Emily did a great job with voicing all characters differently. Wow. She's one great voice actor. Emily's tension grew with the story as we went. In the darkest moments, her voice was strong with emotion, tension, and worry. I felt all the emotions and was drawn to keep listening. Amazing work. I enjoyed her voice acting very much! I've not read or listened to any of Seanan's books yet. This is my first. And I liked how she hints at things with details instead of just saying what the obvious is. Like the description of bruises and seeing ribs, instead of telling there was abuse or lack of food. This gives me a feel rather than just knowing what has possibly happened. We start the book with the Blackstone Family Circus traveling and get a feel for the people in the circus. It's a bit slower paced as we meet the characters in their surroundings. As the story is told, we get it mostly from Annie's view point. But there are times we get the view from Nathanial's mind along with a few others. It's a graceful shift in the story that you don't realize it right away that you are seeing the story from another's view. It keeps the story going forward with a smooth transition. I think if I was reading this book, I would have stopped. It felt slow moving for me. But, Emily's narration kept me holding on. And I started to grow curious about The Clearing. Chapter seven is about when I started getting interested in the story. The reaction of the town to the circus people and Oddities Annie cares for. Things picked up for me in the book when we got to The Clearing. When we got into the woods, oh yes, this is what I was looking for. But before all this, it felt slow. When we get to The Clearing, we start to see the personality of the people who live here. They are... unkind. And the things that could go oh so wrong with what the circus has and the way these town folk are... oh so wrong can happen. Though, when out on the search I get lost in Annie's thoughts as she's walking through the forest. I just didn't feel to connect with this character. I felt as though it was more character driven and I just wasn't into it. I wanted more events to happen. The cover depicts some of the Oddities that Annie cares for very well. I really like this cover. These characters have internal battles they are fighting before they come to the external ones. They grow in their experiences and understandings along with fighting what's after them. Great parallel here with both. Sometimes external battles help make the internal ones clearer. Annie has more baggage she's carrying along, more battles she'll have to fight with what and who is after her.